Legal experts say it’s easier to prove wrongdoing by a corporation than by individuals. 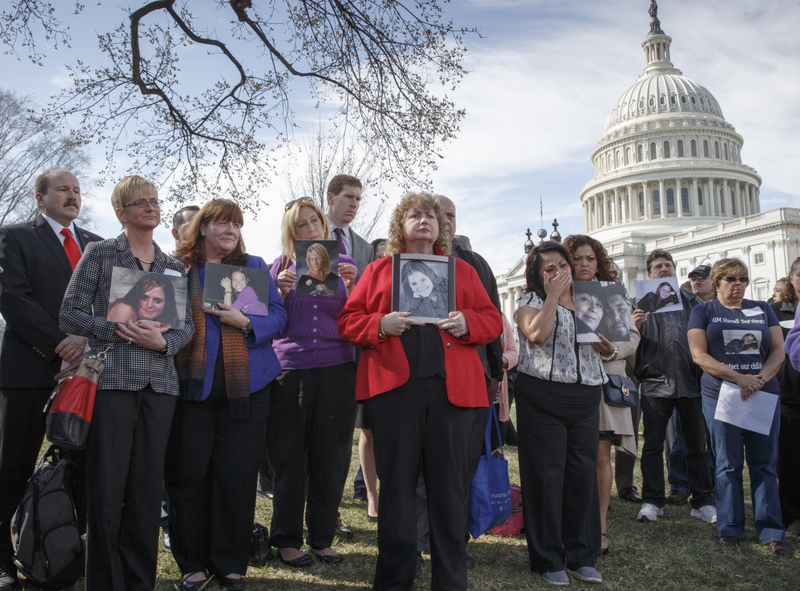 WASHINGTON – The families of those who died in General Motors cars with defective ignition switches want prosecutors to go after GM insiders responsible for letting the problems fester for more than decade – and perhaps for covering them up. “The only way the public is going to be protected from this negligence by companies is if there will ultimately be prison sentences,” said Leo Ruddy of Scranton, Pa., whose 21-year-old daughter Kelly was killed in 2010 when her Chevrolet Cobalt veered inexplicably off the highway and crashed. Family members attended hearings in Washington this week that stoked those sentiments. Lawmakers confronted GM CEO Mary Barra with what they said was evidence that, in 2006, a company employee intentionally tried to conceal the switch problem. And the head of the nation’s auto safety watchdog said GM withheld critical information that connected the failing switch to air bags that didn’t deploy in a crash. “I don’t see this as anything but criminal,” said Sen. Kelly Ayotte, R-New Hampshire, a former state prosecutor. However, even if an employee or employees did conceal information, it’s uncertain whether they would be charged with a crime. Legal experts say it’s easier to prove wrongdoing by a corporation than by individuals. The internal documents that can be used to build a case against the company might be inadmissible as evidence against individuals. And it can be hard to prove that individuals knowingly made false statements. The Justice Department didn’t bring charges against any individuals last month when it closed a yearslong investigation of Toyota. GM has acknowledged that in 2004 and 2005, engineers submitted proposals to fix the switches in Cobalts, Saturn Ions and other small cars, but the fixes were never implemented. GM says upper management only became aware of the problem last year. A recall of the small cars, now up to 2.6 million vehicles, began in February. On Wednesday, Sen. Claire McCaskill, D-Mo., accused one GM employee of a cover-up. Ray DeGiorgio, the lead switch engineer on the Cobalt, said in a deposition last year for a lawsuit against GM that he never approved a change to the ignition switch. But McCaskill produced a document from GM’s switch supplier that showed DeGiorgio signed off on a replacement, but with the same part number. Failing to change a part number makes the part harder to track. Paul Rothstein, a Georgetown University law professor, wouldn’t speak specifically about DeGiorgio, but said someone “caught in a lie” could be more vulnerable to individual prosecution. Barra called the failure to change the part number “unacceptable.” She said the company has not yet fired any employees in connection with the recall. But she said if inappropriate decisions were made, GM will take action, including firing those involved. “If you can go to jail for insider trading and things like that, which is just making money, if you do something that caused a loss of life … (the penalty) should be more than just a few dollars,” said Ken Rimer, whose stepdaughter died in a 2006 accident after a faulty switch prevented air bags from deploying. But Matt Axelrod, a former federal prosecutor now in private practice in Washington, said prosecutors face a higher burden to prove criminal wrongdoing. “The forum before a congressional committee is different than the forum before a jury,” he said. The Justice Department hasn’t confirmed that it’s investigating General Motors, but a person familiar with the case said the probe is underway. The person didn’t want to be identified because the investigation is private. Two weeks ago, the Justice Department socked Toyota with a $1.2 billion penalty over its recall of millions of vehicles for unintended acceleration. But no individuals were charged, even though prosecutors discovered that some managers sought to conceal problems with gas pedals in certain cars. Proving individual guilt beyond a reasonable doubt is much harder than prosecuting a company based on the collective knowledge of all its employees. “To charge an individual, you have to show that one individual acted illegally by himself,” Axelrod said. For now, many of the families are simply seeking more information about the fatal crashes. Originally, Ruddy thought the power steering motor failed on his daughter’s 2005 Cobalt, causing her to crash while returning home from visiting friends in Wilkes-Barre, Penn., late at night. The Cobalt was recalled in 2010 to replace faulty power steering motors. But now he thinks the ignition switch could have shut off the engine, knocking out power steering and brakes and causing her to lose control of the car. GM took the car’s event data recorder, and only recently returned it after the family contacted a Pennsylvania senator for help. The contents are now being analyzed, and the family will be looking to see the position of the ignition switch, Ruddy said. Ruddy says the family is considering a lawsuit against GM but has yet to file one. A family friend who is an attorney is advising them on their next steps. Rimer and his wife have already filed a lawsuit against GM. He’s worried that GM might be legally protected from lawsuits arising from decisions it made before its 2009 bankruptcy.